Tucker’s Jordan West came up with a big strikeout with two outs and the bases loaded in the bottom of the sixth to keep the Region 4-6A contest against the Lions tied at 10-10 as the umpires called the game due to darkness at Martin Luther King on Friday night. West had a 10-8 lead entering the bottom of the sixth inning, but an error and a walk opened up the door for the Lions. Caleb Chisholm singled to right to score Antoine Lloyd who had led off the inning by reaching on the error. A hit batter and a fielder’s choice later Varick Lawrence doubled to left with two out to score Chisholm to knot the game at 10-10. A catcher’s interference loaded the bases before West managed to strikeout Jeremy Cain who had doubled twice off him since he came on to pitch in relief in the bottom of the third. The game was a back-and-forth affair throughout as both teams rallied from deficits after falling behind. The Lions made the first big rally scoring four runs in the bottom of the third keyed by a three-run, bases-loaded double down the third baseline by Jahe Worrell. Worrell would move to third on a throw to the plate and scored as the Tigers threw down to second to get Chisholm trying to steal. Trailing 5-2, the Tigers answered with a three-run fourth using an error and three walks to score all three runs with West driving in a run on a fielder’s choice to short to tie the game at 5-5. The Lions answered with three runs in the bottom of the inning as Jeremy Cain led off with his second double to left center in the game. Lloyd drove in one run as his fly ball to center was misplayed and with the bases loaded a throw to third was wide and went down the line allowing two more Lions to cross the plate for the 8-5 lead. Tucker picked up a run in the fifth as Donnie Harris reached on an error, stole second, moved to third on a wild pitch and scored on Marquez Knight’s sacrifice fly. Knight would pick up two more RBI in the sixth as his two-run, two-out single plated two runs to tie the game at 8-8. Keno Robinson would score on a wild pitch and Mike Robinson beat out an infield single to plate Knight for the 10-8 lead for the Tigers. Tucker scored first as Barry Manning singled and scored on an RBI groundout by West in the top of the first. The Lions answered on an RBI single by Trent Hawk in the second inning. 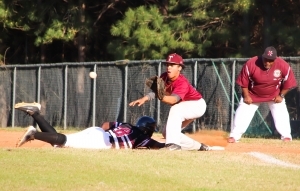 Donnie Harris beat out an infield single with two out in the third to score West for a 2-1 Tucker lead before the four-run outburst by the Lions to go up 5-2. West struck out nine batters in four innings of relief work for the Tigers. Lawrence went 5 2/3 innings for the Lions. Jeremy Cain led all hitters with his 3-5 performance and scored three runs to lead the Lions (8-3-1, 4-2-1). Jahe Worrell was 1-3 with a double and three RBI. Barry Manning was 2-3 with three runs scored for Tucker (8-3-1, 7-1-1) with Mike Robinson going 2-3 with a RBI and Marquez Knight drove in three runs. The game may be finished at a later date if it has a bearing on the Region 4-6A standings.